Description: There are truths contained between the pages of even the most well-worn Bible - truths that have been hidden for generations. The Bible is a simple book to understand, and yet there are promises of God that have not been fully experienced by Christians since the days of the apostles. Tradition, false doctrine and unsound teaching have been used by those opposing the Truth to obscure the clear teaching of Scripture. 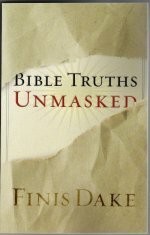 Bible Truths Unmasked will challenge you with a fresh look at some of the familiar promises of God. 1. How to read and understand the Bible. 2. How to reap the benefits of the promises of God. 3. How to detect demon powers and false religions. 4. How to resist the devil and overcome him and his fallen angels and demons. 5. How to keep from being deceived and know whether you are deceived or not. 6. How to detect between manifestations of God and those of evil spirits. 7. How to get into Christ and know the will of God. 8. How to know what sins and bad habits will damn the soul. 9. How to distinguish between carnality and sin. 10. How to have freedom from sin and bad habits and spiritual defeat. 11. How to be born again and know God in reality. 12. How to solve all problems of life, both now and hereafter. 13. How to have unwavering, unshakable, and absolute faith in God. 14. How to know you have the right faith and the right religion. 15. How to increase faith and how to use it. 16. How to be prosperous and succeed in business. 17. How to know whether you will go to Heaven or Hell. 18. How to overcome obstacles to faith and hindrances to prayer. 19. How to have freedom from poverty and want. 20. How to get answers to every prayer. 21. How to know when prayer is not going to be answered. 22. How to know when you pray right and when prayer will be answered. 23. How to know when it is God's will to heal and answer prayer. 24. How to get bodily healing and have sound health. 25. How to have freedom from sickness, pain, and disease. 26. How to become master of yourself and be free from worry and anxiety. 27. How to do the works of Christ and even greater than he did. 28. How to have power with God and suffer no defeat in life. 29. How to have all the gifts of the Holy Spirit. 30. How to exercise unlimited authority in all the fullness of God. Dimensions: (Length x Width x Height): 89/16" x 5.7/16" x .5/8"